When all was said and done after five incredible, breathtaking rounds in UFC 192's main event in Houston, it was Daniel Cormier who stood atop the Light Heavyweight division. "DC" ousted Alexander Gustafsson with a split decision victory in a fight-of-the-year candidate. Scorecards read 47-48, 48-47, 49-46 in favour of the American—and he was full of only gratitude for his opponent after the battle which saw both men pushed to their limits on a night where Rashad Evans' return was foiled and prospects continued their climb to the top. "I just wanted to prove that I'm not one dimensional", an exhausted champion told Joe Rogan following the fight. He certainly went lengths to do so, keeping the fight on the feet in the latter rounds and really testing the 6'4" challenger and demonstrating his chin too when on the receiving end of some brutal strikes. Congrats to the champ @dc_mma ! Great fight! Huge props @AlexTheMauler ! While wrestling is the speciality Cormier's arsenal, he was taken down on more than one occasion in the fight, but it wouldn't bother him as he went on to prove his worth and withdraw the critics who questioned his legitimacy as the UFC Light Heavyweight Champion. Gus reiterated that, saying post-fight that "DC is a beast. He proved he can strike. He's the real, legit champ." His right eye was filled with blood, while his opponent mirrored the agony with a cut on his nose—but the glory that the winner would become a recipient of was more than worth it. The blood on the European was at the hands of a tactic which Cormier utilised throughout the fight, vicious uppercuts in the clinch and they made a difference on the scorecards. Alexander Gustafsson came up short on what was his second bid to win a UFC Championship, but he fought valiantly, moving quick and fast to create space when being charged down by Cormier, and landing a few huge knees—one flurry of which put the champion in trouble. With fans in the Toyota Center getting to their feet as the warriors looked to conclude their title fight, Cormier did what was needed, and he forced Gustafsson to defend rather than to push forth for a late finish. And with that, he remained UFC Light Heavyweight champion in a battle that shall be remembered for the ages. 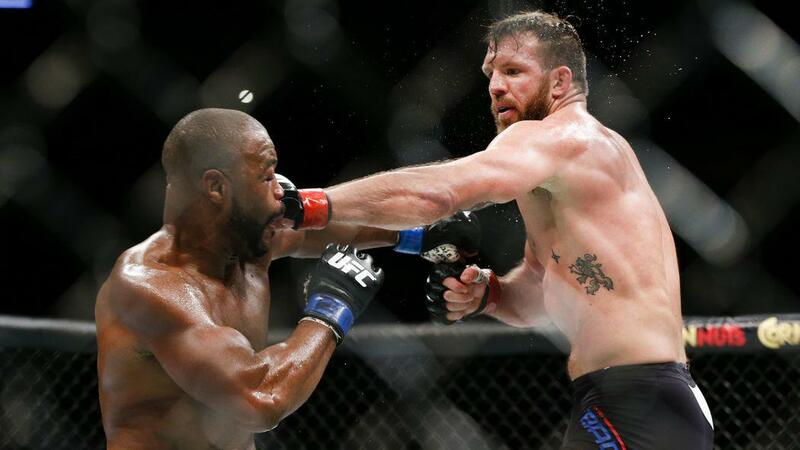 Speaking of champions, a former Light Heavyweight Champion ended an almost two-year layoff to return to action but it was spoiled at the hands of a clinical performance by Ryan Bader who notched his fifth straight win. "Suga" looked off the beat—ring rust perhaps contributed to that—and Bader was able to outwork him, keep sharp footwork and do all that was necessary to rack up the points in the judges eyes. Throwing a takedown into the mix too, Bader went on to win by unanimous decision—the biggest victory of his career—and perhaps move to the front of the queue for a title shot in a crammed Light Heavyweight division. Moving a division up to Heavyweight and Shawn Jordan came up short against a technical display from Ruslan Magomedov, unleashing a lot of punishment on the heavier American, and using an array of kicks and other strikes to make his name known—even if the Houston crowd weren't too happy about it. And then down to Flyweights, two of the best in the world squared off, and he named Joseph Benavidez would win on points, dispatching a resistant Ali Bagautinov over the course of a fight contested mostly on the feet. Julianna Pena defeated Jessica Eye via decision to start the main card—but the real thick of the action was found in a dazzling preliminary lineup, which featured Sage Northcutt scoring a 57 second victory in his UFC debut, along with three televised prelims finishing in the first round as Namajunas, Tumenov and Martins made some seismic statements. But leaving Houston, what will be fondly remembered is the war that took place in the main event. Alexander Gustafsson and Daniel Cormier both left a piece of one another inside the eight-sided cage—but will probably be better off for it. What a war.